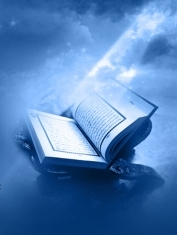 Home > Articles > God - The Creator > Love of God > Ibn Abbas’s deep insight into the Qur’an. Ibn Abbas’s deep insight into the Qur’an. Ibn Abbas said, “Umar used to make me sit with the elderly men who had fought in the Battle of Badr. Some of them felt it (did not like that) and said to `Umar "Why do you bring in this boy to sit with us while we have sons like him?" `Umar replied, "Because of what you know of his position (i.e. his religious knowledge.)" One day `Umar called me and made me sit in the gathering of those people, and I think that he called me just to show them. (my religious knowledge). `Umar then asked them (in my presence). "What do you say about the interpretation of the Statement of Allah: 'When comes Help of Allah (to you O, Muhammad against your enemies) and the conquest (of Mecca).' (110.1) Some of them said, "We are ordered to praise Allah and ask for His forgiveness when Allah's Help and the conquest (of Mecca) comes to us." Some others kept quiet and did not say anything. On that, `Umar asked me, "Do you say the same, O Ibn `Abbas?" I replied, "No." He said, 'What do you say then?" I replied, "That is the sign of the death of Allah's Messenger (ﷺ) which Allah informed him of. Allah said:-- '(O Muhammad) When comes the Help of Allah (to you against your enemies) and the conquest (of Mecca) (which is the sign of your death). You should celebrate the praises of your Lord and ask for His Forgiveness, and He is the One Who accepts the repentance and forgives.' (110.3) On that `Umar said, "I do not know anything about it other than what you have said." The others had understood only the dhahir [apparent] of the meanings – yet the deeper meanings that Ibn Abbas had understood and Abu Bakr [in the lifetime of the Prophet saw] that this Surah indicated the death of the Prophet [saw]. If one reflects on the timings of asking forgiveness, one finds these are often towards the end of something, end of the night being the optimum time for forgiveness, the end of the Salah after the tashahud and before the taslim etc. Hence, they understood that for the Prophet to be told to ask for forgiveness after the people had entered into the fold of Islam in their multitudes meant the coming to the end of the mission of the Prophet [saw], hence his death.